A decision tree maker is the best tool for simplifying complicated processes, including those frequently faced in customer support, technical troubleshooting, sales optimization, training, program enrollment, and communications, to name a few. Presented in a customized, standardized, and completely interactive environment, decision trees have the potential to make a huge impact on the efficiency and effectiveness of any business or organization. 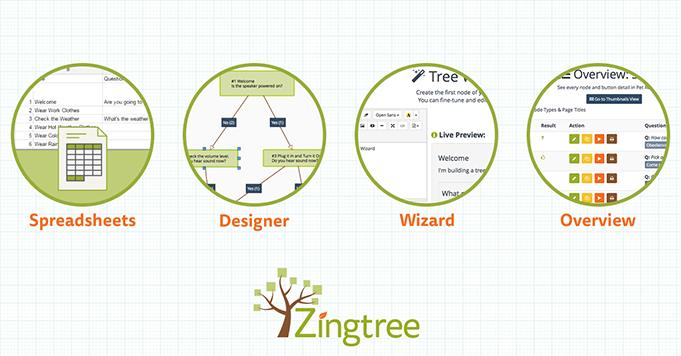 Zingtree is an online decision tree maker that allows you to quickly build, customize and publish interactive decision trees online, and comes fully-loaded with real-time analytics and reports. Easily draft and import any Google Sheets or Excel document into Zingtree and turn it into a decision tree. Once imported, you can enhance using powerful editing tools that offer more decision tree-related functionality than spreadsheets alone. Designer lets you easily “draw” a decision tree. On a single display, you’ll be able to view and create the nodes and pathways for your decision tree and see exactly how it’ll flow. Watch the Designer tutorial video here. Wizard builds a tree through prompts, using a form-based approach. The tool walks you through how to make a decision tree, while you input the questions and answers. Watch the Wizard tutorial video here. Overview is a form-based option for creating trees node-by-node. The editor has tools for refining to perfection and is ideal for content-rich decision trees. Watch the Overview tutorial video here. Basic decision trees can always get the job done, but with a little bit of added effort, you can gather amazing data, as well as really blend into your company brand or personality. Add your own custom CSS for personalization (and check out this advanced customization by Duda!). Create tests, quizzes, assessments, and anything else that requires assigning a score to each question answered. Integrate with other powerful services, like Zapier, Salesforce, and WordPress, and get the most from your trees. Add video and other visuals to help make complicated processes even more clear. Always write the questions and answers within your decision tree for your audience. Frame your questions in a specific way in order to collect the right kind of quantitative data. Need more help getting started? Have a question? Want more tips? We’re always here for you. Please contact us via the chat bubble on our site and we can help you there.